Using personal stories, fun interactive games, a brief Q and A time, along with some pet therapy and dog tricks, Lisa demonstrates why bullies bully, why we shouldn't bully the bullies, and how to stop bullying and cyber bullying. At the end of each presentation students are motivated to take the CHANGE CHALLENGE. Whether they were targets, bullies, or bystanders before this program, they decide to change, not allow bullying and instead be peer supports and mentors. 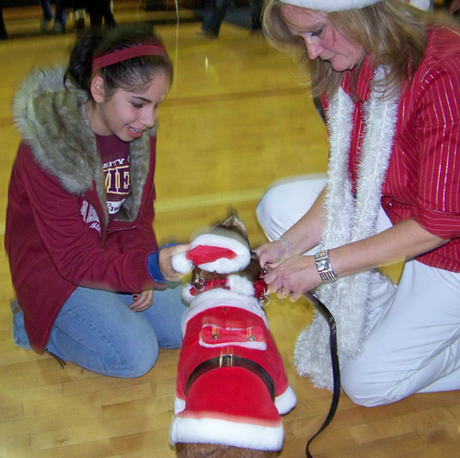 These PAWS for Abuse and Bullying were founded in 2006, by lifetime abuse survivor, Lisa Freeman. During this time her children were dealing with bullying issues in school and bullying was becoming a world-wide epidemic. One day she had a vision about speaking at a funeral of a young girl--a victim of dating violence. She was shown through this vision that she could save lives if she began sharing her story publicly. This vision was so earth shattering that it challenged Lisa to step out of her comfort zone (while still battling PTSD and Panic Attacks) and begin her work of changing hearts and saving lives..
She then realized that her rescue dog, Snickers, now a Certified Pet Therapy Dog, was the key element in the task before her. Using their paralell stories of being abused runaways, and how they were brought together and healed, Lisa developed the new curriculum in just two short weeks. Take A Bite Out Of Abuse (now known as Abuse Bites) was loved and approved by school boards, family abuse agencies, and animal shelters. 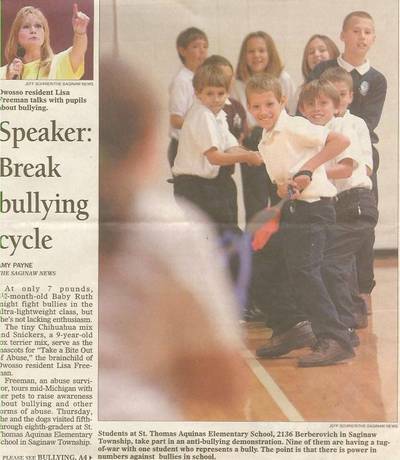 That same fall, Lisa began presenting in public and parochial schools all over Michigan. Each year she tweaks the program, updates statistics and research, and develops new curriculum to meet the ongoing needs.